Rob Dunlavey is an illustrator from the Boston area. His work has appeared in many American magazines and newspapers. His whimsical illustrations can also be seen in several major children's museums in the US (Miami, Long Island and New York City). 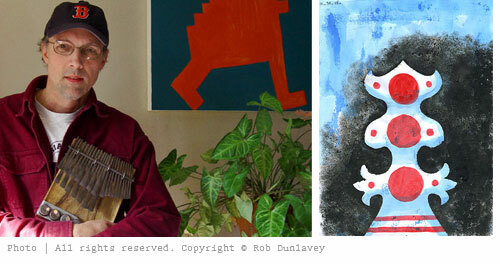 Rob likes his art raw, funny, touching, bordering on the abstract and colorful. He is excited by exploiting the expressive potential of all mediums: vector, paint, collage, printmaking and linear drawing styles. More information and work can be found at www. robd.com. Rob is an inveterate doodler and is constantly filling up sketchbooks. Some of that work is just beginning to find its way out into public. He is eager to find a home in professional applications for this new imagery. In addition to making pictures of all types, Rob listens to and attempts to play Zimbabwean mbira music, drinks coffee and follows the Boston sports scene.